Voltaire (1694 – 1778), originally known as François-Marie Arouet, was born to an upper middle class family, in Paris, France. Orphaned at an early age, he was cared for by his free-thinking godfather. He attended the Collége Louis-le-Grand, a Jesuit secondary school in Paris, where he received a thorough education in the classics. In 1715 —at 21-years of age— Voltaire was exiled to Tulle for mocking the regent Orleans. In 1717, he returned to Paris, only to be arrested and exiled to the Bastille for a year for writing alleged libelous poetry. Again, in 1726, he was sent to the Bastille for arguing with the Chevalier de Rohan; after being detained there for two weeks he was shipped off to England, where he would remain for the next three years. When his Letters on the English Nation (1733) appeared, the book angered the French church and government, forcing Voltaire to flee to Lorraine. He remained there for the next 15 years with his mistress, Emile de Breteuil, at the Château de Cirey, visiting Paris occasionally. By 1778, he enjoyed widespread fame as a literary genius, and he returned to Paris a hero. Voltaire wrote poetry, plays, historical works, and philosophical works. The earliest of Voltaire’s best-known plays is the tragedy Oedipus, which was first performed in 1718. Other dramatic tragedies followed, including Mariamne (1724), Zaïre (1732), Mahomet (1736), and Nanine(1739). Voltaire's body of writing also includes the notable historical works The Age of Louis XIV (1751), and Essay on the Customs and the Spirit of the Nations (1756). This latter work traced the progression of world civilization by focusing on social history and the arts. Two months later he died in his sleep on May 30, 1778, in Paris, France. This story is a philosophical, romantic satire, attacking religious mania, the foibles of people in general, the burdens of being virtuous and happiness. Voltaire uses ancient Babylon as his setting, which provides a great contrast to France of the Enlightenment; Babylonians though scientifically and technologically advanced, had a closed culture ruled by an absolute monarch. In brief the story chronicles the adventures of Zadig, a benevolent and charismatic figure who reveres the good and the beautiful. 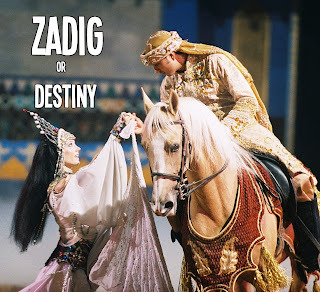 Despite incidental amorous detours, Zadig’s love for Queen Astarte glows a paragon of sublime fidelity to woman. Edgar Allan Poe may have been inspired by Voltaire’s Zadig when he created C. Auguste Dupin in "The Murders in the Rue Morgue," which Poe called a tale of ratiocination and which established the modern detective fiction genre. Arthur Conan Doyle was perhaps also influenced by Zadig. And not without reason, many critics and scholars identify Zadig as the first systematic detective and original source of the genre. Comments on "Voltaire's Zadig or Destiny"